… so why aren’t we smashing our targets? We might need to hustle! Sales can be a complex activity with many, differing variables often required to come together at once to achieve a sale. Often one or more of these variables combine to frustrate us. But what can we do about them? We probably often feel that fate is against us or that we’re powerless to make things happen. But as salespeople you have the power! You can make it happen. It’s all about urgency and our mindset as salespeople, it’s about planned, strategic activity and most of all it’s about driving this activity. As salespeople our default position is often to inaction – we don’t want to pester people or be seen as hard selling – but it’s only through activity, not inactivity, that we’ll achieve our desired results. Just do it! How do we do this?? We hustle! Create ways to further develop your relationships. Remember 80% of new transactions are completed between 5 and 12 contacts, yet only 10% of salespeople follow up after 3 contacts. Gain all the knowledge you need to position the strengths of your offering – about their operation, current arrangements, history, contract renewal dates, what’s important to them, deadlines. 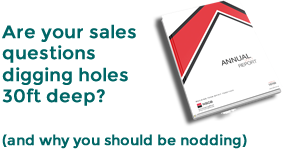 Everything you need to know to accelerate your sales process. Keep in regular touch. Add value when you are in touch to build your relationship. And hustle. Find out what’s stopping them doing business with you and get them past it. Be nosy, focus on needs and… hustle!